I. What is a Chronicle? A chronicle (pronounced kron-i-kuh l) is a historical account of events (real or imagined) that are told in chronological order, meaning from first to last as they occur in time. It typically records events as witnessed or understood by the person writing the chronicle (the chronicler); but it is fundamentally objective, not interpretive. It is used as a style of writing in both fiction and nonfiction. Chronicle comes from the Middle English word cronikle, which has the same meaning. The man woke up in the morning. He got dressed, went downstairs, and ate a bowl of cereal. Then he drove to work and went to meetings all day, not even stopping for a lunch break. At the end of the day, he was the last one out of the office. On his way home from work he picked up a pizza. When he got home, he turned on his favorite TV show and ate the pizza while he watched it. When the show was over, he threw away the pizza box, went upstairs, brushed his teeth, and got into bed, where he fell asleep within five minutes. The passage recounts the man’s day in chronological order, presenting the information objectively as it occurred. However, it would likely function as one entry in a larger work, such as in a chronicle of the man’s year or a chronicle of his career as a businessman. A dead chronicle recounts events of the past only up until the time the author begins writing; it does not include any events that occur after. For example, a work titled “London: A Chronicle of a City in the 20th Century” would be a dead chronicle, as it only sets out to account what happened in London in the past. A live chronicle recounts events as they occur continuously, like many magazines, newspapers, journals, and other media with daily, weekly, monthly, or even yearly editions. Many newspapers include the word “chronicle” in their title, which signifies that they are telling the news as it happens. Chronicles create a timeline of events, which is implicitly important in both storytelling and historical writing. They are more are much more comprehensive than a simple timeline, as they provide details and information about events, rather than just the time and order in which they happened. Chronicles help to record the histories of all aspects of human life—politics, religion, weather, law, fashion, language—nearly any topic can be chronicled. Furthermore, the way in which chronicles report information is objective, orderly, and accurate; and therefore reliable. A majorly important series of chronicles in English literary history is the Anglo-Saxon Chronicle, which began in the 9th century and was updated into the mid 12th century. Much of the history of the Anglo-Saxons can only be found in this collection, including important information on the history of the English language. 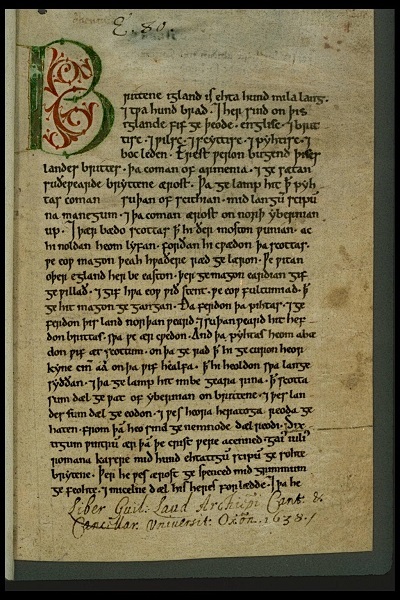 The accounts were written in Old English, and fragments of the Anglo-Saxon Chronicle (below) are preserved in England today. The Chronicles of Narnia is a fantasy fiction series by C.S. Lewis, which recounts the events surrounding the imaginary world of Narnia as seen through human eyes. The books chronicle the entire existence of the fantasy world, beginning with Narnia’s creation in the first book, The Magician’s Nephew, and ending with its ruin in the final book, The Last Battle. The popularity of these books, however, lays not in the series itself, but it the second book, The Lion, the Witch and the Wardrobe, which Lewis wrote first and originally intended to be the only book about Narnia. Because of its popularity, Lewis developed the story it into a full series to chronicle Narnia’s history. Now, the finished series goes in chronological order from Books 1-7, so that the mysteries of Narnia that arose in The Lion, the Witch and the Wardrobe are explained and expanded upon for the audience. Truly, the Chronicles record two separate timelines—that of the human world, in Britain, and that of Narnia, While Narnia’s existence is 2500 years long, it functions differently in time—its 2500 year history translates to only 50 years in the real world, and the characters are different ages depending on whether they are in Britain or in Narnia, which creates an intriguing and fantastic chronicle. The Spiderwick Chronicles is a popular series of children books in five parts, published from 2004-2006, which was followed by a second series in three parts, called Beyond the Spiderwick Chronicles, published from 2007-2009. The books chronicle the adventures of a pair of twins who discover a world of faeries upon moving to the Spiderwick Estate. Additionally, there are several companion books, which cover topics that are important within the chronicles or are actual books used by the characters, such as Arthur Spiderwick’s Field Guide to the Fantastic World Around You. The book identifies magical faeries, such as the entry Deep Forest Sprites above. The children find this book in the first book of the series, which leads them to the discovery of the faerie world. As the series chronicles the events as they happen in the children’s lives, the Field Guide is a consistent part of the story; in fact, one of the children chronicles his own findings by adding notes to the book as he makes new discoveries. The 2012 action thriller Chronicle recounts the life and certain events of a teenage boy named Andrew. The events are displayed through video footage from a variety of sources (cell phone cameras, handheld video cameras, etc), which are pieced together in chronological order; creating a chronicle of his life. As can be seen from this example, chronicles continue to change in form as time and technology progress. What could once only be recorded on paper and in memory can now be shown through newspapers, television shows, movies, online news, etc. A narrative is a story or account of events (real or imaginary) in both fiction and nonfiction. Narratives are principally different from chronicles in that they do not have to follow chronological order. A timeline is a list of events presented in the order in which they occurred. Generally timelines only present basic information, such as dates and crucial details. While chronicles also present information in a chronological order, they are much more comprehensive in terms of the information they include. In conclusion, chronicles are a necessary and relatively simple way of recording and representing events in both fiction and nonfiction. They are the ideal style for the orderly and relevant presentation of information about historical events; whether real or imaginary, and allow authors to record details as they unfold(ed) chronologically.